Klik på billedet og se alle billeder fra Los Juncos Patagonian Lake House. WiFi tilgængeligt på alle områder, Lystfiskeri, Skiløb, Vandring, Cykling, Ridning, Restaurant, Roomservice, Bar, Grillfaciliteter, Snackbar, Massage, Lufthavnstransport, Cykeludlejning, Biludlejning, Transport (mod tillægsgebyr), Lufthavnstransport (mod tillægsgebyr), Valutaveksling, Sightseeingskranke, Bagageopbevaring, Have, Terrasse, Spillelokale, Bibliotek, Møde-/festlokale, Fax/fotokopiering, Ikkeryger-værelser, Familieværelser, Varme. American Express, Maestro, Visa, Cabal, Euro/Mastercard, Diners Club. Featuring a big garden and an organic orchard, Los Juncos Patagonian Lake House offers 5 unique rooms in a charming Alpine-style house in front of Nahuel Huapi Lake. Free WiFi and breakfast are provided. There is a restaurant, a bar, and ski storage is provided. Decorated with country-style furnishing, each room at Los Juncos is decorated in a particular way. All of them have private bathrooms with hairdryer. First-rate linen is provided. A continental breakfast is served daily. Tea service and 3-course dinner prepared by the owners themselves with ingredients from the orchard can be enjoyed in the dining room, which affords lake views. Argentinean wines can be ordered at the bar and vegetarian meals can be requested. Guests can relax in the garden or in the living room overlooking the lake. Portable DVD players and laptops are available. Bilingual cooking classes and massage sessions can be arranged. Los Juncos can arrange ski, horse riding, rafting, kayak, sailing, trekking, and mountain bike activities for its guests, as well as car and bicycle rentals. Laundry and babysitting services are available for an extra fee. 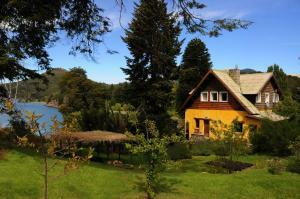 Los Juncos Patagonian Lake House is 3 km from Campanario Hill and 5 km from Puerto Pañuelo and Llao Llao National Park. Teniente Luis Candelaria International Airport is 31 km away and the city centre is 20 km from the property.